Google Search is the most popular search engine in the world with a market share of at least 60% in most countries. It is therefore only natural that most webmasters optimize their websites for Google Search. Search engine optimization has on the other hand no rulebook where everyone could get the information needed to optimize the website for the search engines. There are literary millions of opinions on how to do SEO right. Most have some optimization techniques in common like placing a relevant keyword at the beginning of the page's title or acquiring niche relevant links from other websites. But there are also many myths and half-true information that can get webmasters into trouble. The subjects and topics are listed in short form at the top and explained in detail afterwards. Experienced search engine optimizers will probably not find anything new in the listing but it can be very helpful for webmasters who just begin as a webmaster and those who want a straight answer from an authoritative source. 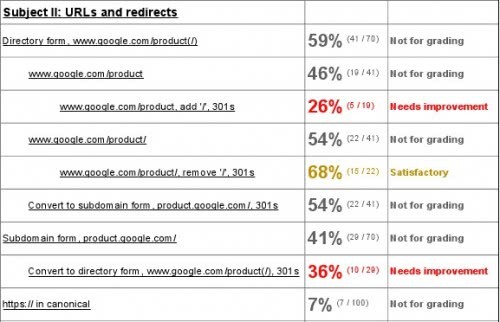 The Google SEO Report Card is provided as a download link at Google's Webmaster Blog.